Twitter data shows that activity spiked when Jenkins nailed the game-winning three-pointer—there were 30,000 tweets per minute at that moment. 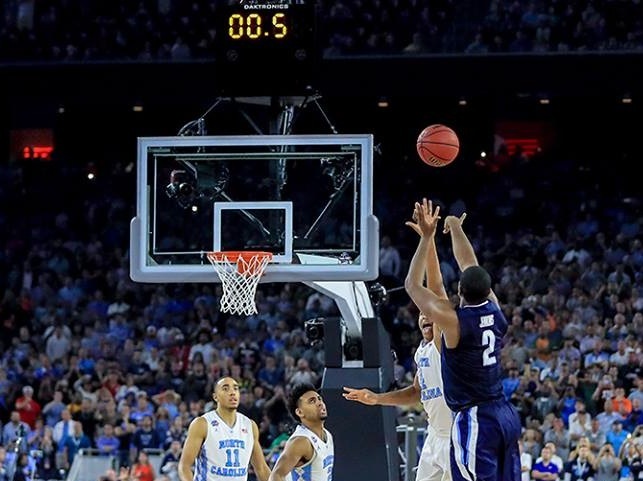 From tip-off to the afterglow of Villanova’s Kris Jenkins’ buzzer-beating championship-winning shot, Nielsen measured more than 1.8 million U.S.-based tweets about the NCAA Men’s Basketball Division I title game Monday night. According to Nielsen, more than 787,000 people in the U.S. were tweeting about the game, far outpacing the next-most-popular sporting event on Twitter: the Los Angeles Dodgers Opening Night matchup on ESPN with the San Diego Padres, which generated 113,000 tweets by 50,000 people. Even with his last-second heroics, SocialFlow data shows that he wasn’t the most buzzed-about player in last night’s game. That honor goes to North Carolina’s Marcus Paige. Seconds before Jenkins’ game winner, Paige sunk a game-tying three point shot that appeared to send the game into overtime. SocialFlow data shows that there were more than 157,000 tweets on Monday about Paige. In total, SocialFlow counted more than 2.39 million tweets so far Tuesday about the game. SocialFlow’s data shows that since the game, Jenkins has received a 6000% increase in mentions. A funny note: Social mentions of the crying Michael Jordan meme spiked Tuesday. As of publication, there have been more than 106,000 mentions of #CryingJordan or crying Jordan. Brandwatch tracked social mentions of both teams, showing that while Paige’s shot led to a big boost in mentions for UNC, Jenkins’ dagger was massive for Villanova on social. Image courtesy of Ronald Martinez/Getty Images on Sporting News Photos.